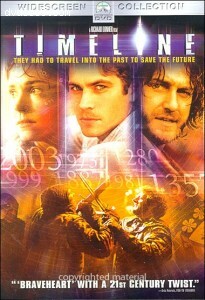 This page contains easter eggs for the disc Timeline (Widescreen) (DVD, Region 1). On the DVD's "Main Menu" use the directional keys of your remote control to highlight the icon in the center of the screen, which looks a bit like a Celtic cross. Now press your Enter button and you will see how the menus of the DVD change from their 1357 theme to a present-time 2003 theme. Now, you can do the same on that new menu layout by selecting the dome in the lower center of the screen. It will then take you back to the 1357 menu style.